Mobile service providers have clear challenges ahead as they adapt to the new wireless ecosystem created by innovative devices, attractive applications and the resulting explosion in network traffic usage. As networks continuously evolve to meet capacity and coverage demands with the latest technological capabilities (i.e., 3G, 4G), network costs are exploding and operators struggle to maintain profitability. 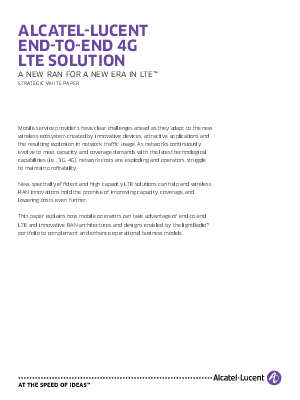 New, spectrally efficient and high capacity LTE solutions can help and wireless RAN innovations hold the promise of improving capacity, coverage, and lowering costs even further. This paper explains how mobile operators can take advantage of end-to-end LTE and innovative RAN architectures and designs enabled by the lightRadioTM portfolio to complement and enhance operational business models.